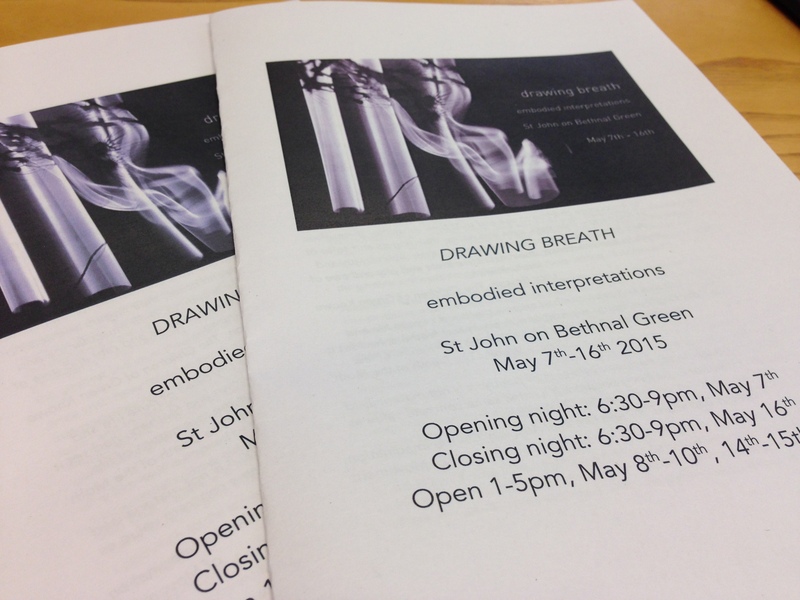 These are the curatorial notes I made to accompany the Drawing Breath exhibition at St John on Bethnal Green. It is still on until 16th May, so do get down to see it if you can. Anna Cady and I have been collaborating for over five years. We were brought together because of the ways that she practices forms of creative collaboration, particularly relating to bodies: the bodies of vulnerable people, the bodies of dancers, of refugees, of children. My research on embodiment and phenomenology in film and art brings me to think about how we experience our bodies in front of creative work, but also what creative practice does to and with our bodies. 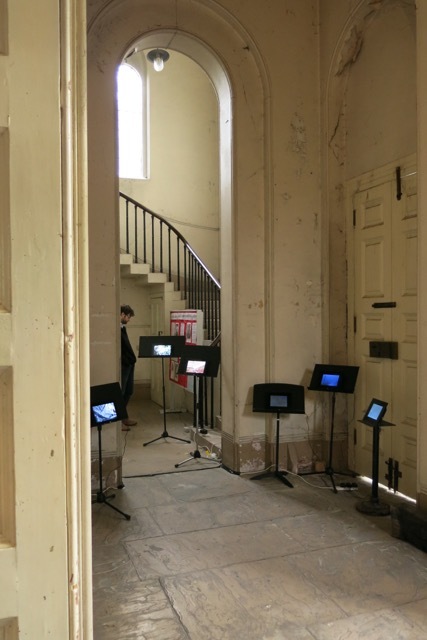 Elemental Dialogues, of which the film AIR, centrally installed here, forms the third part, is partly a story about ways of linking the interweaving stories of film, poetry, sound, composition, dance and drawing. Anna and I have talked at length about the precarity of making a creative interpretation: how vulnerable a position it is for an artist to let go of a piece of work, and to give it freely to someone else for their interpretation. 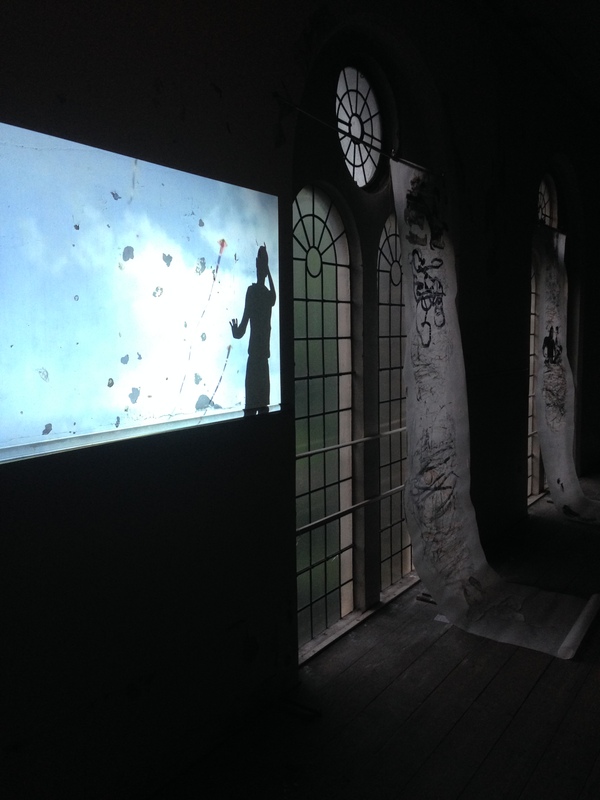 This is what has happened with AIR: the film was given generously to other artists, who have generously given back to produce the diverse work exhibited here. The film itself is inspired by the concept of air as an element – in the old sense – as a fundamental component of life. Inspiration – a taking in of different elements – is also what Pauline and Anna’s film works have done, drawing on writing from Rainer Maria Rilke, Virginia Woolf, Lucy Boston, Gaston Bachelard and TS Eliot. However, in opposition to the conventions of film narrative, AIR does not begin with words – it begins with images and sensations. The stories, as Anna tells it, flow out from there. The process of embodied interpretation is not about inspiration, however. 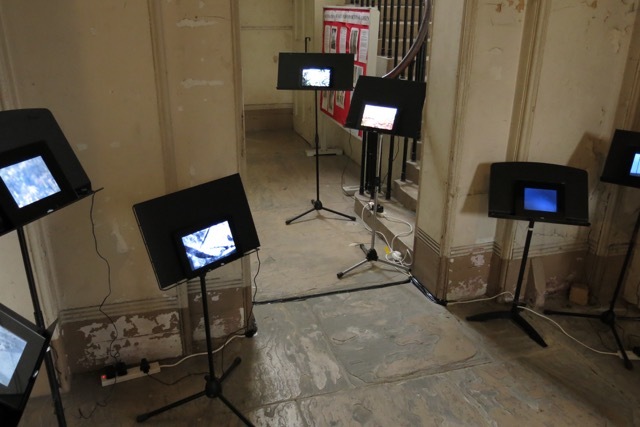 Part of the thought-work of the project has been to come to terms with what embodied interpretation means, and how the instruction to produce an ‘interpretation’ differs from a response, or an inspiration. What we were seeking, as curators of this project, were not works inspired by – breathing in – the film AIR, but works that exhaled, articulated, an interpretation, through the body of the artist. So many of these interpretations speak of breath: Tami Haaland’s short poem uncovers the paradox of breathing – how air knows, ‘sees’ our insides in a way that we never can. Briony Bennett’s poem speaks of the things that are given and taken away in a breath. Sebastiane Hegarty’s composition sits on the cusp of the audible, decomposing and recomposing the sounds of a match, struck and flaring. Jan Henrickse’s sound piece shifts echoes, reverberations and rhythms across glass-like textures that exceed the opening and closing moments of the film’s frames. Time is pliable in each interpretation: some stick closely to the time of the film, accompanying it through each fade and billow. Others follow these ebbs and flows with humorous curiosity – like a.rawlings and Sachiko Murakami’s sound poem. Gabriel Galvez’s butoh-inspired movements flex sensuously with his breath; more than this: the breath he takes in, his interior sense of his body’s air, interprets (organically, primally) the film AIR, and the sites in which it is projected: in this case, the softly illumined staircases, arches and galleries of St John. 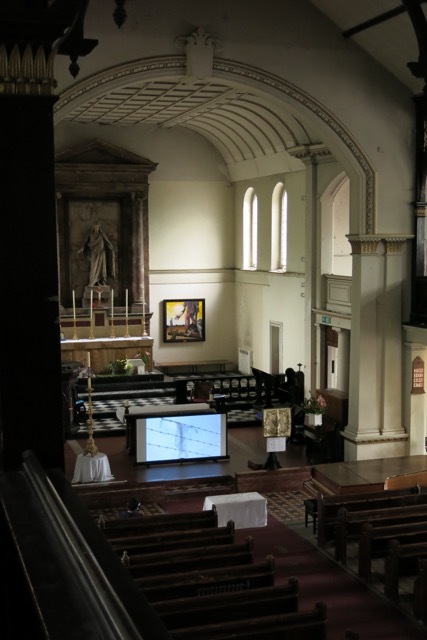 The curation of these works had to compete with another layer of interpretation: the weighty, light-filled spaces of St John on Bethnal Green. Light is not a friend to moving image projection. Unlike the dark, companionable domestic spaces of Drawing Breath’s first exhibition at Green Knowe in Hemingford Grey, the heft and texture of church walls, pews, ceilings, staircases insist upon curation that works with, rather than against the early summer light in a church on a busy East London junction. Church installation of one of the AIR films: central in front of the altar. The cruciform shape is hard to miss in this context. There is another pathway in this exhibition. A quieter, more hidden one, away from the witty bustle of a.rawlings and Sachiko Murakami’s sound poem, or Gabriel Galvez’s intimate dance movements and Melanie Rose’s tacit drawing. This is a pathway that requires delicacy and gentleness, and is as ephemeral, and as enduring, as the installation itself. 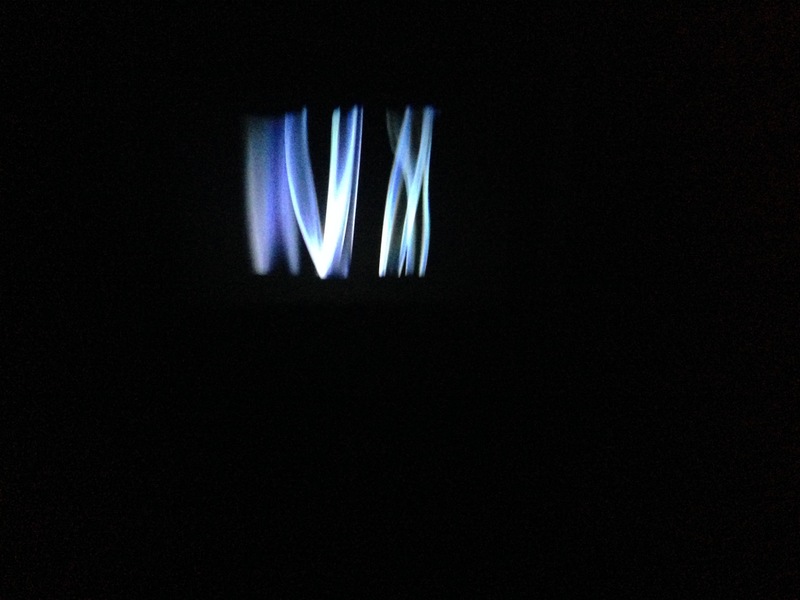 AIR is a collaborative film, co-created between Anna Cady and Pauline Thomas. Their work is mutual, so much so that neither Anna nor Pauline can see where one artist’s work begins and the other’s ends. In this sense, their creative stories are inextricably intertwined. But in a way, they are also quite separate. This exhibition is about breath, just as the previous exhibition at Hemingford Grey this March was too. In particular, it is about limited breath, liminal breath, dying breath. Pauline, whose touching work is gentle, ephemeral, has always been interested in the fleeting moments between life and death, light and dark. And Pauline is dying – or rather, as she puts it herself; she is living with terminal illness. Pauline has graciously, generously given me permission to write about this. I’m grateful to her for letting me make public such an intimate and personal state of life. The reason I am doing so is because of this second pathway towards Drawing Breath, a pathway of mortality and intimacy. So many of the artists, poets, and composers involved in this project reflected on AIR from the position of breath. And for Anna, the film and the project are entirely about Pauline’s breath: her breathing, fragile, mortal body, but also her gentleness, her inspiration, her fascination for the smallest of gestures (a spider’s web glistening with water droplets, a flame struck endlessly inside a tiny matchbox). We did not share this information with the participants when they were working on their interpretations. This was both in order to respect Pauline’s privacy, but also because mortality is a life element that so thoroughly colours our experience, it might have prevented our artist participants from making work about the film from any other perspective. Inevitably, there is something elegiac about Drawing Breath. But this is both about Pauline and not about her at one and the same time. It is also about breath as a moment on the precipice between living and not-living, as an invisible trace, as a moth trapped in the lamplight, as a temporary enchantment, as astral dust motes, as smoke unfurling between two towers that coruscate into the dark. As darkness on a bright May evening, as the life of a day lily. All these are pathways through Drawing Breath. Now seek yours. This entry was posted in Anna Cady, Gabriel Galvez, Jenny and Anna, Jenny Chamarette, Melanie Rose, Pauline Thomas and tagged a.rawlings, air, Anna Cady, artist moving image, artistic practice, Briony Bennett, Drawing Breath, dust, elemental dialogues, embodied interpretations, film poem, Gabriel Galvez, Gaston Bachelard, inspiration, Jan Hendrikse, Jenny Chamarette, Lucy Boston, Melanie Rose, mortality, moth, Pauline Thomas, poetry, Rainer Maria Rilke, Sachiko Murakami, Sara Maitland, Sebastiane Hegarty, sound, St John on Bethnal Green, Tami Haaland, TS Eliot, Virginia Woolf on May 12, 2015 by drjennycee.